Sometimes the best lessons are not the ones that happen within the confined walls of the classroom. They are not meticulously planned, nor are they teacher-driven. Sometimes the best lessons – the best teaching moments – come from our students; it is then that we, as educators, find ourselves taking a step back and letting them teach us. It’s an incredible moment when everything just clicks; when we no longer have to guide our students in their learning because suddenly – and it seems to happen so suddenly – they just get it. In the spring of 2012, I had the opportunity (along with a colleague of mine) to travel to Europe with twenty-two energetic (read: very energetic) and enthusiastic high school students. Walking through the memorial grounds of the Sachsenhausen concentration camp was a haunting experience. There, you couldn’t just turn the page if you didn’t like what you saw; there, you were forced to face one of the darkest moments in human history, even with only the solid frame of the camp remaining. The history there was tangible. You could touch it; you could see it. There was something so incredibly heavy about the experience of walking where others once walked – and died – and where part of a brutal history was once made. I remember the sun being warm on our faces as we walked alongside a long stretch of wall. Every so often, tall towers broke away from the wall and stood, looming ominously, above us: our first welcome. The feeling was cold and empty. 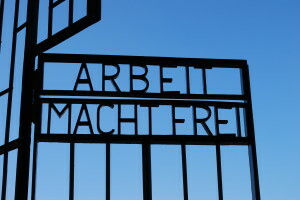 We walked through the gate with the words “Arbeit Macht Frei” echoing in our thoughts – a twisted mentality. The gate was not closed and yet somehow the feeling of being trapped was overwhelming. There were no breaks in the walls and a wire fence stood on each end of the gate to serve as a reminder of what once was. We walked in silence – an impressive feat for twenty-two students. At one point, a student of mine broke the reflective silence with a simple, whispered observation: “They were people, too.” She didn’t elaborate and she didn’t need to. 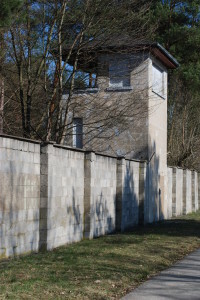 200,000 people were imprisoned in Sachsenhausen between 1936 and 1945 – a combination of political prisoners and those deemed inferior (physically and racially) by the National Socialists. The prisoners wore coloured patches, a way of labelling the inferior; even in prison, there was a class system. Thousands of people died at Sachsenhausen. They died from abuse, starvation, exhaustion, illness, experimentation, and execution. They were prisoners of circumstance and they were people, too. 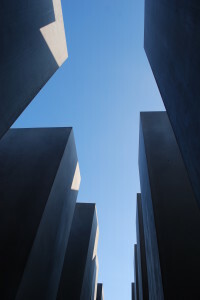 Our tour also took us to Berlin, where we walked the hauntingly beautiful columns of the Memorial to the Murdered Jews of Europe. The symbolism of the monument remains unclear, with each person taking their own interpretations and feelings away from it. To my students, those columns represented people and that, I think, was the most powerful symbolism of all. My students took the opportunity to touch the columns (many of them taller than they were). The tangibility of the stone had a profound effect on what they had already experienced on the tour. It brought about reflection and in a sense, finality, to what they had already learned and experienced. The effect this tour had on the students (and on me) was incredible, and almost indescribable. 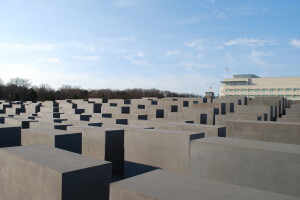 These historical and memorial landmarks made the classroom lessons real to them. I remember looking at the twenty-two young, silent faces and seeing both fragility and a little bit of hope, each lost within the depths of their own minds, trying to make sense and to piece together everything that they were seeing – everything that they were experiencing. Each and every one of those young individuals, myself included, left those sites forever changed. That is why we do what we do. That is why we teach our youth about the history of our world and about difficult subject such as the Holocaust. We teach them because they need to understand. We teach them because those that were murdered, or had their lives forever changed, they were people, too. They deserve our compassion, they deserve our respect, and they deserve to be remembered. 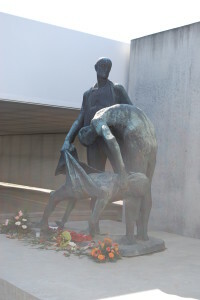 This week we remember those people – the innocent who lost their lives at Sachsenhausen and at other concentration camps set up by the Nazis during World War Two. We remember not only those who lost their lives, but those who lost their families and their innocence, as well. Whether you visit the local grounds of a former residential school, a museum of human history, or one of the countless cemeteries, memorials, ghettos, or concentration camps in Europe, you are not leaving the classroom; you are bringing a new one to life. What fantastic experiences have you had with your students? What will forever stick with you as the moment where everything just clicked – where your students just got it?